Spectacular Perennials for a Cutting Flower Garden Landscape! 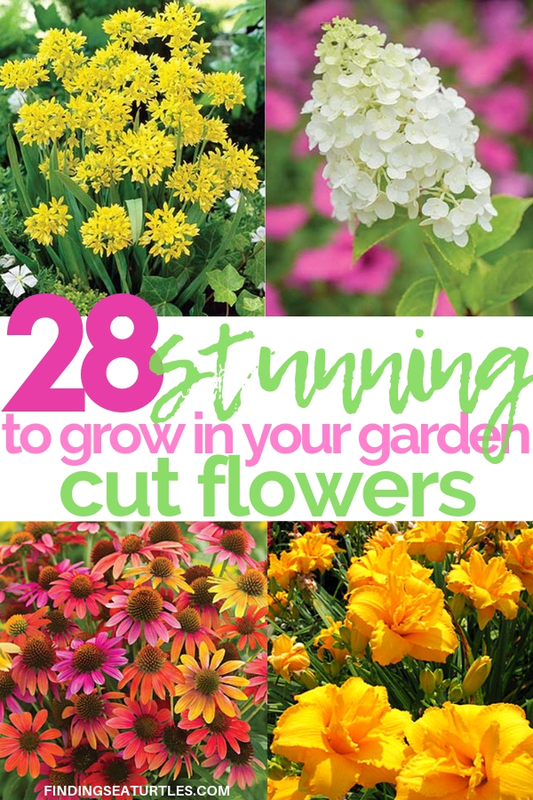 Have you thought about creating your own cutting flower garden? A private cutting flower garden for your use only. Where you grow the kind of flowers that you like. A garden with flowers for your home. A private garden with beautiful, fresh flowers to give away as gifts to friends and family. 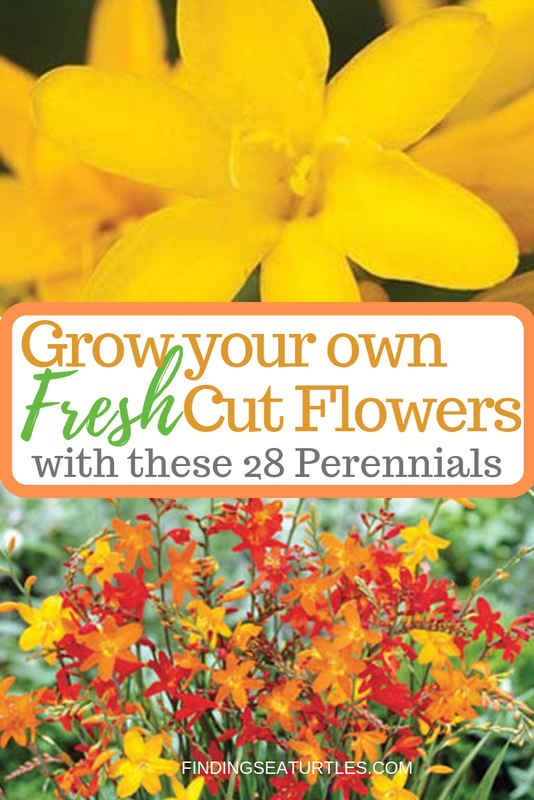 Now is the time to think about creating that cutting flower garden of your own. Grow your favorite perennials to bring inside your home and give away as bouquets. If you are considering a cutting flower garden then look at these plants. We’ve found 28 perennials that are great choices for creating a cutting flower garden. 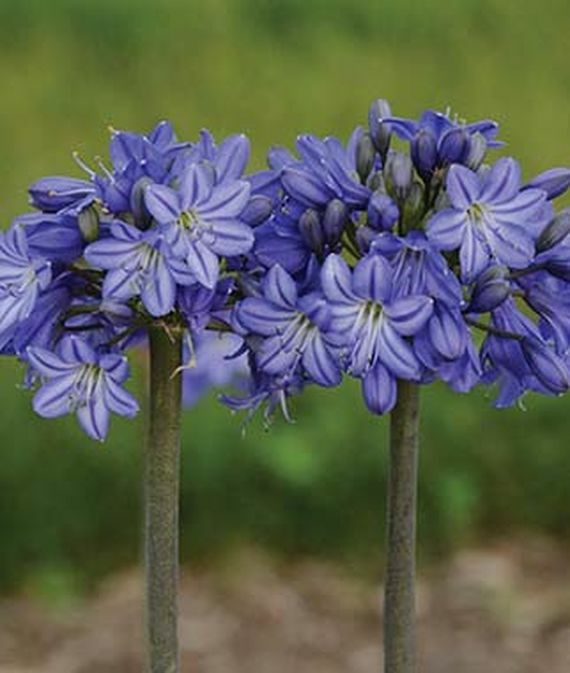 Agapanthus Galaxy Blue has 4 inch constellations of blue blooms on 36 to 40 inch tall stems. Galaxy Blue grows in zones 6 to 10 in full Sun. Blooms over the Summer, perfect for creating Summer bouquets. A continuous bloomer thru early Fall, Galaxy Blue makes a stunning cut flower. Plant Galaxy Blue in flower beds or along a garden border. 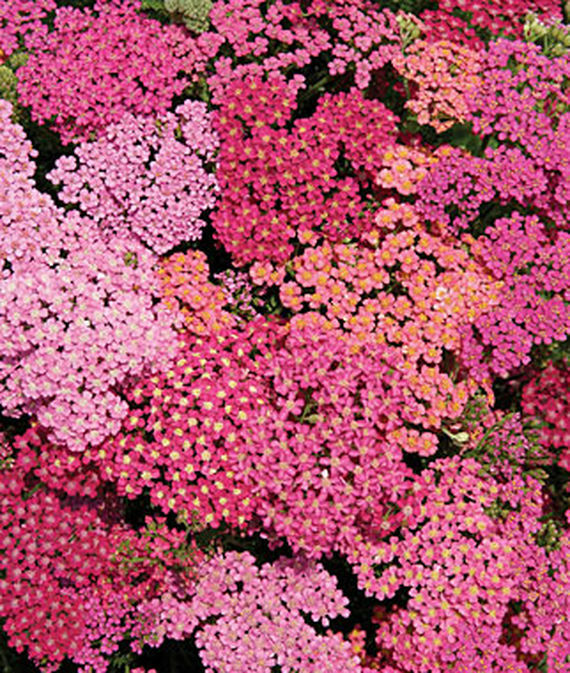 Shades of bright reds, roses, and violets, Cherries Jubilee Achillea is a pink lovers dream come true. Deer resistant and sun loving, Cherries Jubilee Achillea grows in zones 5 to 8. An excellent cut flower for bouquets or for use in a dried floral arrangement. Cherries Jubilee tops out at 24 to 28 inches. 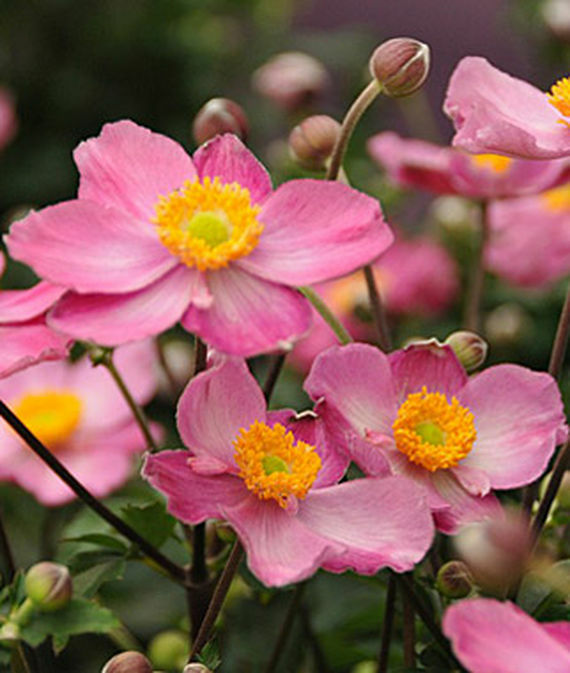 Fantasy Cinderella Anemone has bright pink cupped flowers with gold centers. Blooms from mid-Summer through Fall. Grows in zones 5 to 8 in part Sun and part shade. Fantasy Cinderella reaches 12 to 18 inches tall. A deer resistant perennial, Fantasy Cinderella attracts butterflies and bees. This Anemone has long-lasting cut flowers which is why this is an excellent choice for a cutting flower garden. 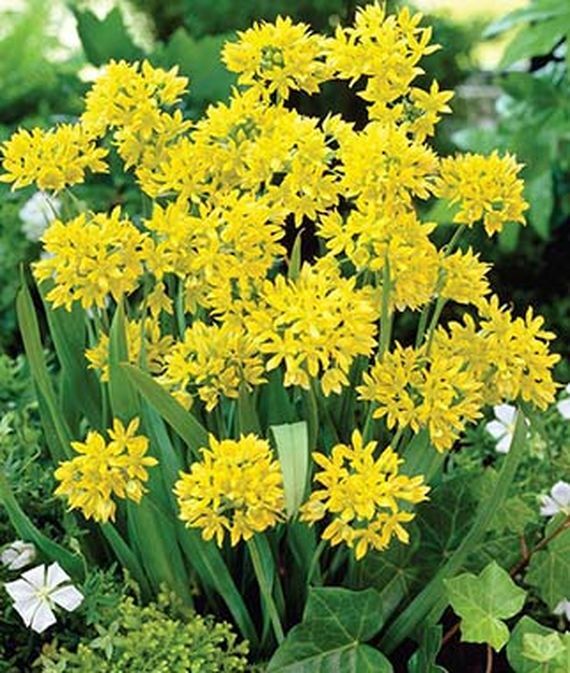 Hardy Allium Moly has bright yellow flowers that bloom late into Summer. Deer resistant Allium Moly grows in zones 3 to 9 in full Sun. Topping out at 8 to 16 inches tall. Allium Moly is resistant to cold, drought, and heat. Fall planting Moly bulbs that make beautiful cut flowers. Moly is rabbit resistant too. 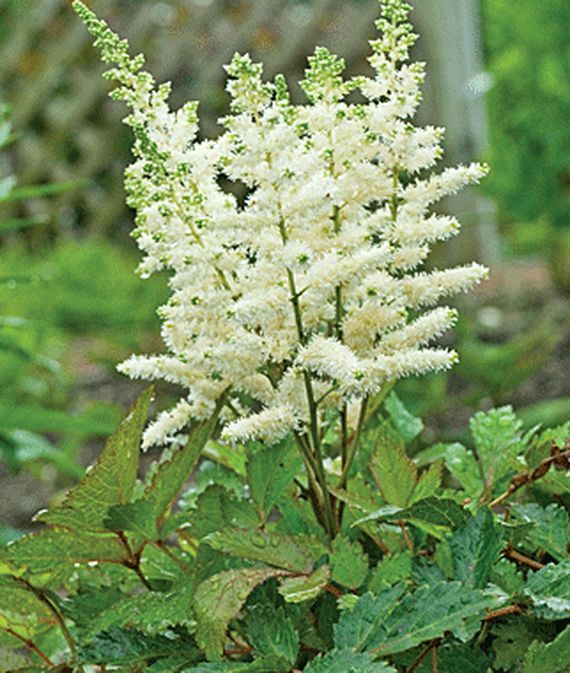 Shade loving Younique White Astilbe has soft, feathery white plumes. Grows in zones 4 to 9, reaching 16 to 20 inches tall. Summer blooming Younique White is deer and rabbit resistant. Younique White feathery plumes add a little flair to your cut flower arrangements. 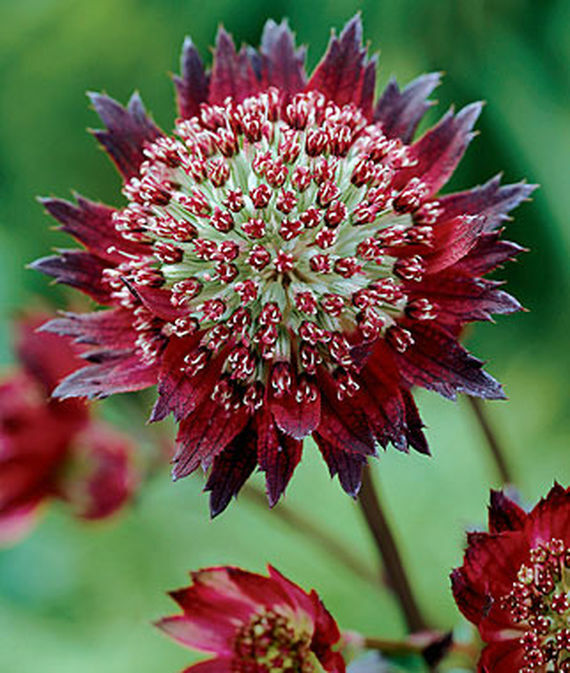 Moulin Rouge Astrantia has maroon flowers all Summer. Use in either fresh or dried cut floral arrangements, Moulin Rouge grows in zones 4 to 7. Tops out at 18 inches tall, Moulin Rouge likes part Sun and part shade. No wonder that butterflies are attracted to these gorgeous maroon flowers. 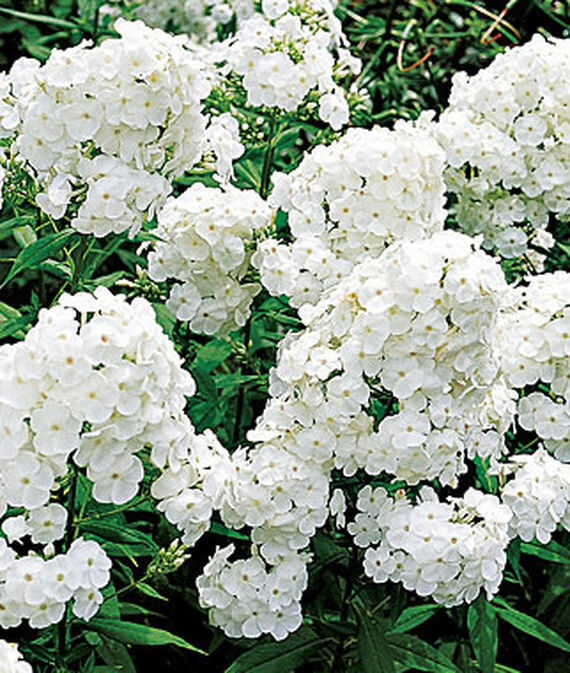 Early Snowball Baby’s Breath has small, double, white flowers for use in fresh or dried floral arrangements. Drought resistant Early Snowball grows in zones 4 to 8 in full Sun. At 36 inches tall, Early Snowball blooms in the Summer. 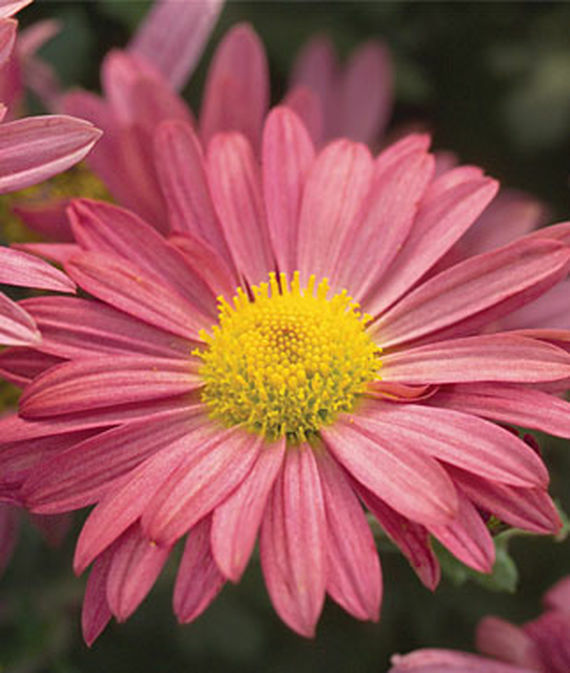 Hardy Mammoth Daisy Coral Chrysanthemums have coral blooms that turn into lavender pink. Mammoth Daisy Coral Chrysanthemums grow in zones 3 to 9 in full Sun. Fall blooming Mammoth Daisy Coral grows between 20 to 36 inches tall. Deer and rabbit resistant, the Daisy Coral makes beautiful cut flowers for Fall arrangements! Fragrant Georgia Peach Pie Dianthus has fragrant large, pink flowers with coral peach center. Georgia Peach Pie grows in zones 5 to 8 in full Sun. Topping out at 10 to 12 inches. Summer blooming Georgia Peach Pie makes a lovely fresh cut floral bouquet. 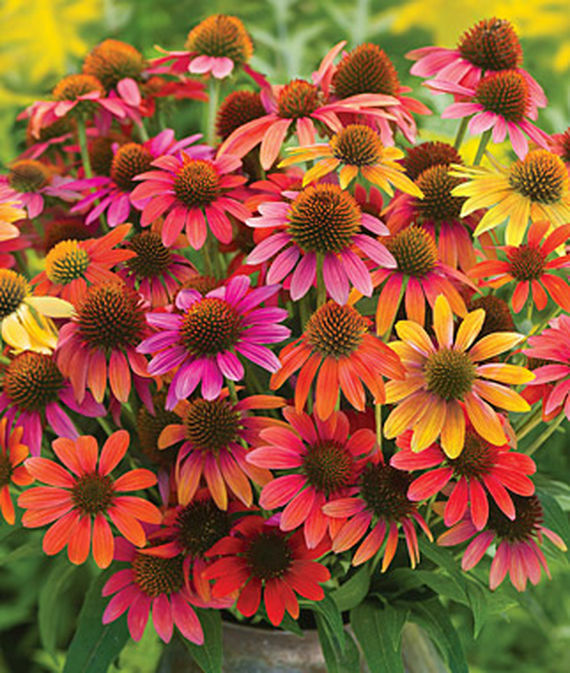 Warm Summer Echinacea is a palette of lush, warm colors that creates a tropical garden spectacle. Summer blooming with shades of orange, yellow, scarlet red, rose, purple, and cream. Warm Summer grows in zones 4 to 9 in full Sun. Reaching 26 to 30 inches tall. Deer and rabbit resistant Warm Summer is the ideal cut flower. 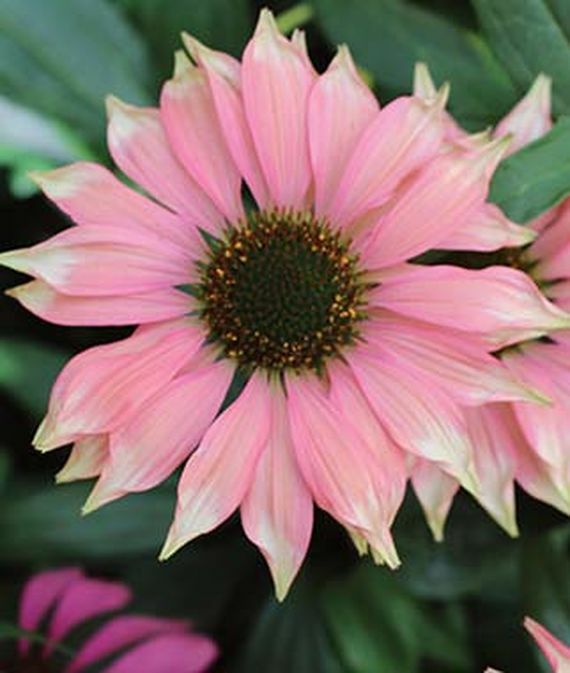 Sun loving Playful Meadow Mama Echinacea has raspberry booms with pointed white tips. Playful Meadow Mama grows in zones 5 to 9, reaching 20 to 24 inches tall. Meadow Mama is disease and pest resistant. Perfect for a cut flower garden. 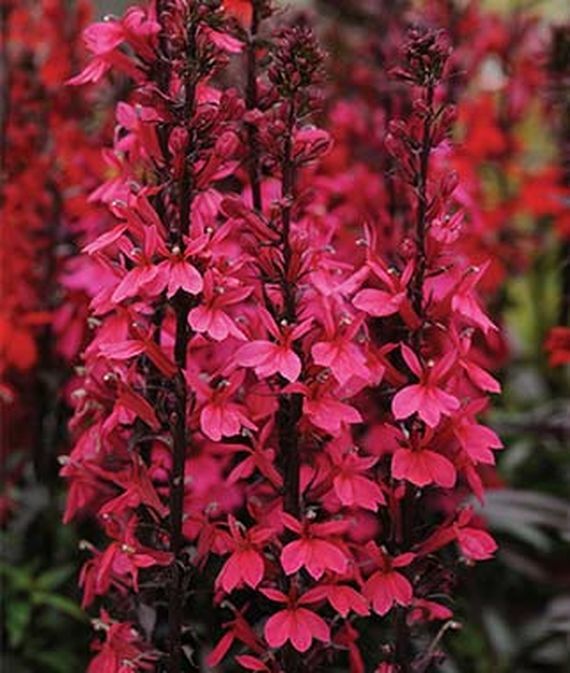 Starship Deep Red Lobelia speciosa has towering spikes of deep red blooms with bronze foliage. Dazzling Starship Deep Red grows in zones 6 to 10 in full Sun. Reaching 20 to 24 inches tall. Stunning Starship Deep Red blooms in the Summer and Fall. Starship Deep Red is resistant to wet soils, deer, and rabbit. Makes a lovely addition to a cut flower garden! 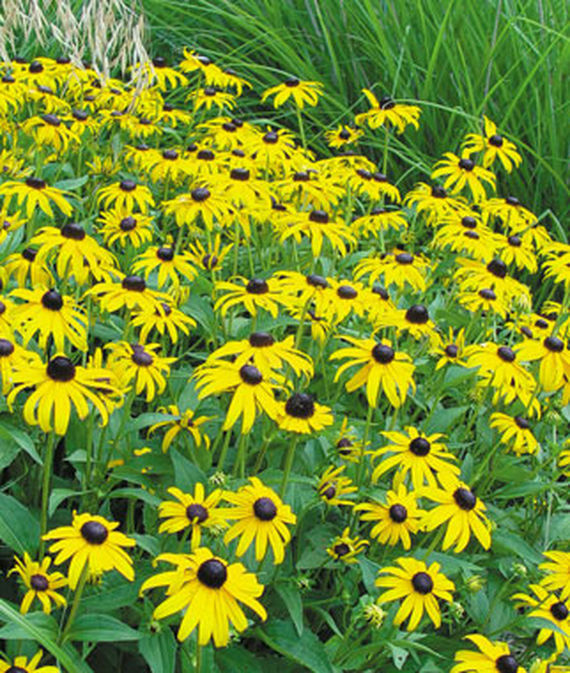 Goldsturm Rudbeckia has bright golden-yellow petals that surround the dark brown centers. Goldsturm Rudbeckia grows in zones 3 to 8 in full Sun. Reaching 24 to 36 inches tall. Bold Goldsturm blooms in the Summer and Fall. Drought resistant Goldsturm Rudbeckia is a prolific bloomer. Deer resistant rudbeckia makes gorgeous bouquets. 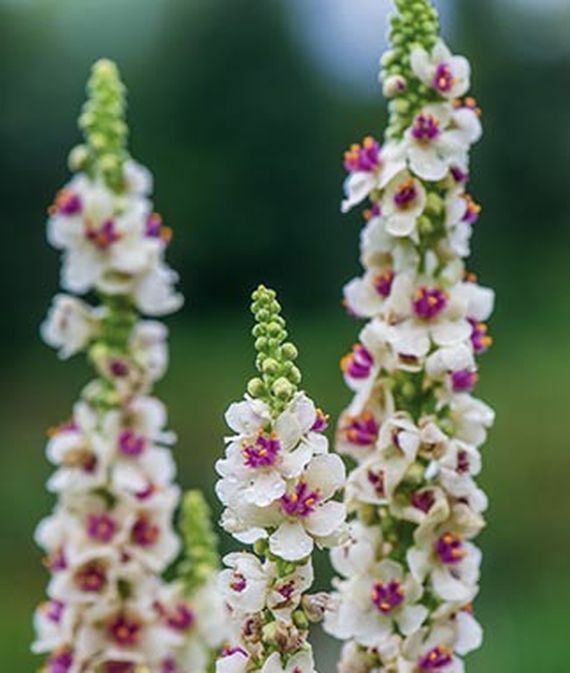 Summer blooming Snowy Spires Verbascum has pure white floral spikes with lush green foliage. Snowy Spires grows in zones 5 to 8 in full Sun. Reaching 18 to 30 inches tall, Snowy Spires is a striking perennial. 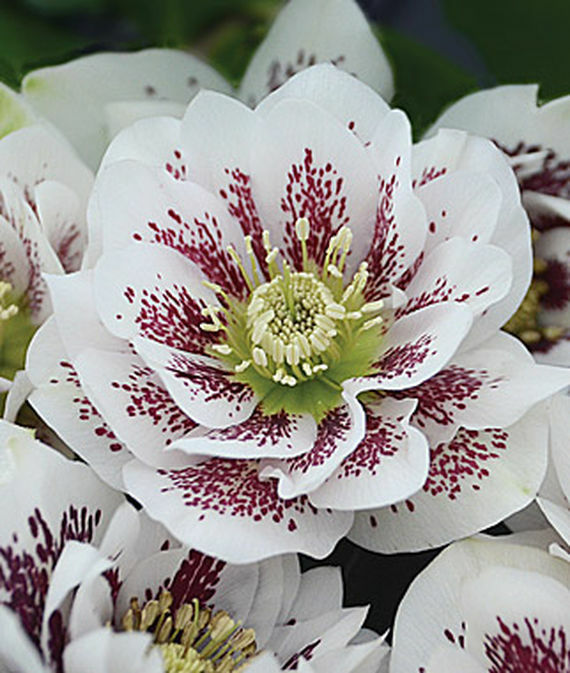 Ideal for cut flower gardens with graceful, romantic spires. 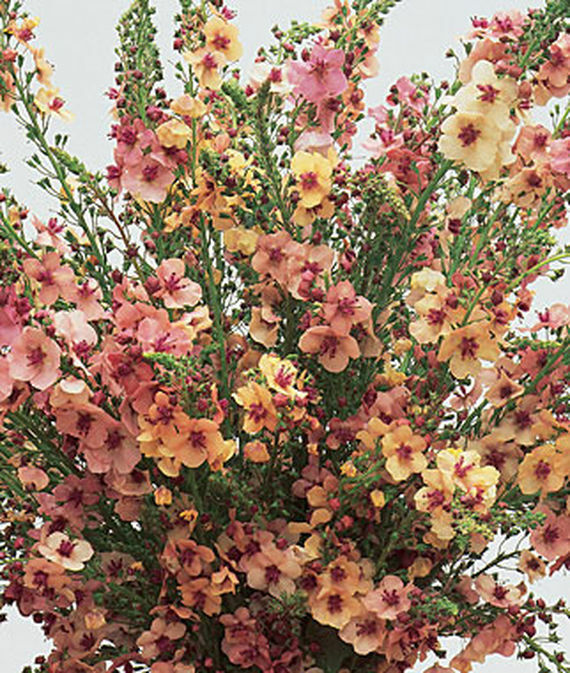 Elegant Southern Charm Verbascum has soft shades of buff, lavender, and soft rose. Southern Charm grows in zones 5 to 8 in full Sun. Grows in height between 30 to 36 inches tall. Southern Charm blooms in the Spring and Summer. Resistant to drought conditions and deer. For beautiful cut flowers, grow Southern Charm in a cut flower garden. Spring blooming Wedding Party Confetti Cake Hellebore has double, white flowers with burgundy speckled petals in the center. Confetti Cake grows in zones 4 to 9 in full shade or part shade and part sun. Tops out at 18 to 24 inches tall. Spring blooming perennial Confetti Cake is resistant to cold temperatures and pests. Resistant to deer and rabbits as well. Confetti Cake is a great addition to a cut flower garden. Because it is so versatile, Confetti Cake can be grown in containers, too. 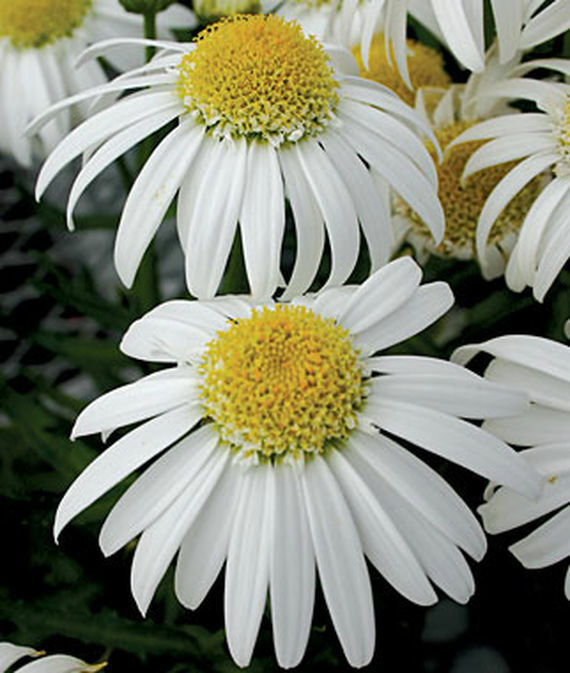 Alaska Shasta Daisy has pure white petals with soft yellow eyes. Shasta Daisy grows in zones 4 to 9 in full Sun or part Sun and part shade. Reaching a height of 30 to 36 inches tall. Blooms in Spring and Summer. Resistant to drought, deer, and rabbits. The Alaska Shasta Daisy is a great addition to a cut flower garden. 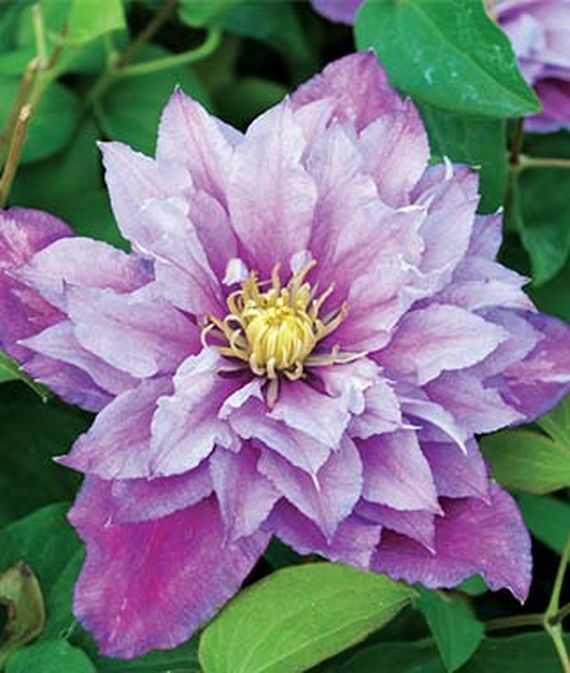 Hardy Piilu Clematis has double flowers that are light pink petals with darker purple red bars. Piilu Clematis grows in zones 4 to 9 in full Sun or part Sun and part shade. Tops out at 4 to 6 feet tall! Nice! Blooms in the Spring and Fall. A nice addition to a cut flower garden. A perennial vine that looks gorgeous in a garden bed or as a garden border. Easy to grow Tai Pan Crocosmia has solid, dark yellow blossoms. Tai Pan grows in zones 5 to 9 in full Sun or part Sun and part shade. Tops out at 24 to 26 inches. Deer resistant Tai Pan blooms in Summer and Fall. So perfect for a cut flower garden addition. Plant Tai Pan perennial in flower beds or along flower garden borders. Fragrant Mixed Crocosmia has bright reds, yellows, and orange flowers. Blooms appear on arching stalks above green foliage. Mixed Crocosmia grows in zones 5 to 8 in full Sun. 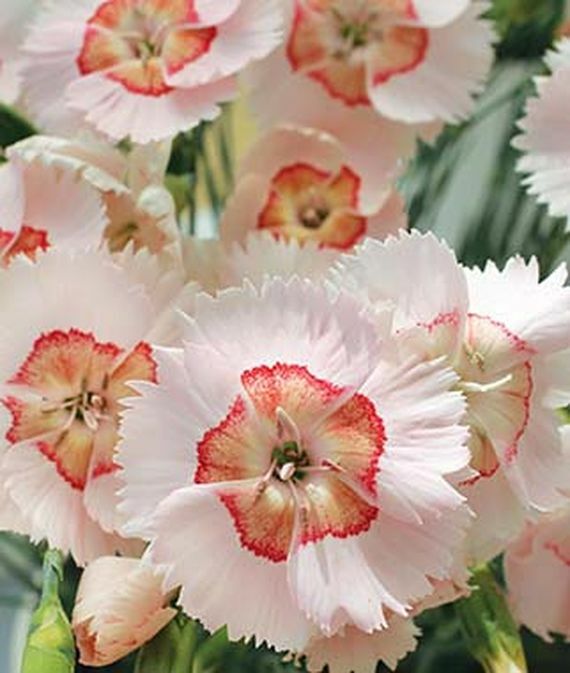 A perennial with Spring planting bulbs that top out at 24 to 36 inches. Blooms during the Summer season. Resistant to deer and rabbits. Beautiful bright colorful blooms for a cut flower garden. 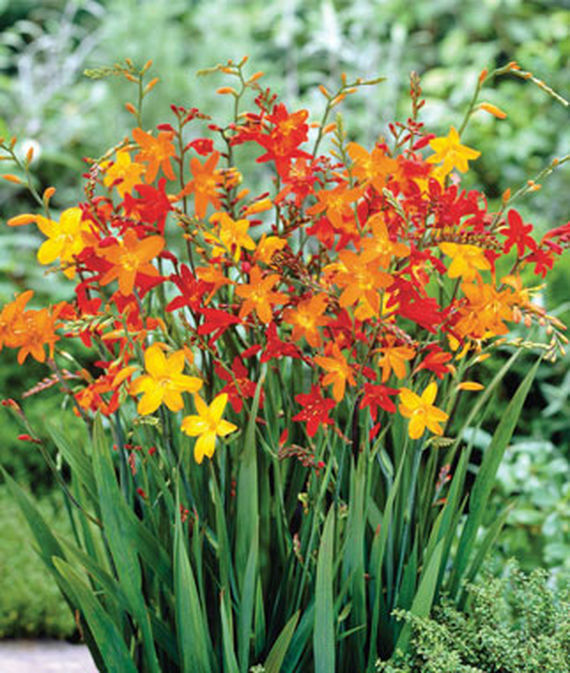 Plant these Crocosmia bulbs in flower beds or along flower borders. 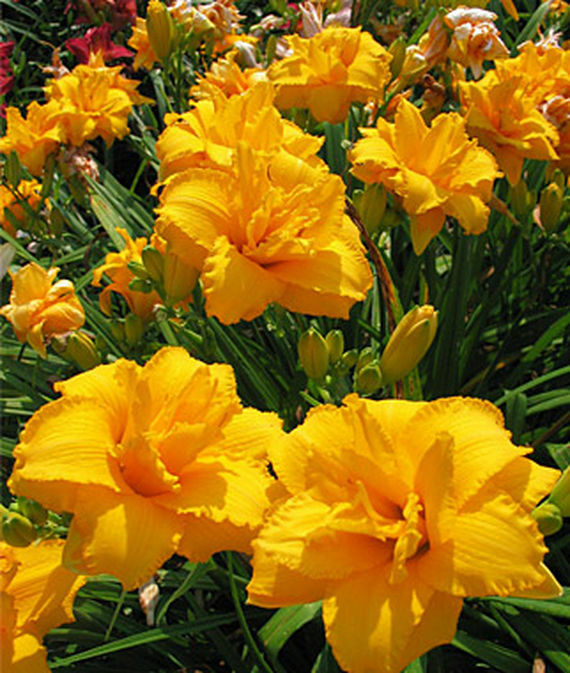 Summer blooming Condilla Daylily has vibrant deep golden yellow flowers with ruffled edges. Condilla Daylily grows in zones 3 to 9 in full Sun. Reaching 18 to 20 inches tall. Resistant to cold temperatures and rabbits. The Condilla Daylily is a beautiful cut flower garden choice. It will brighten your home! 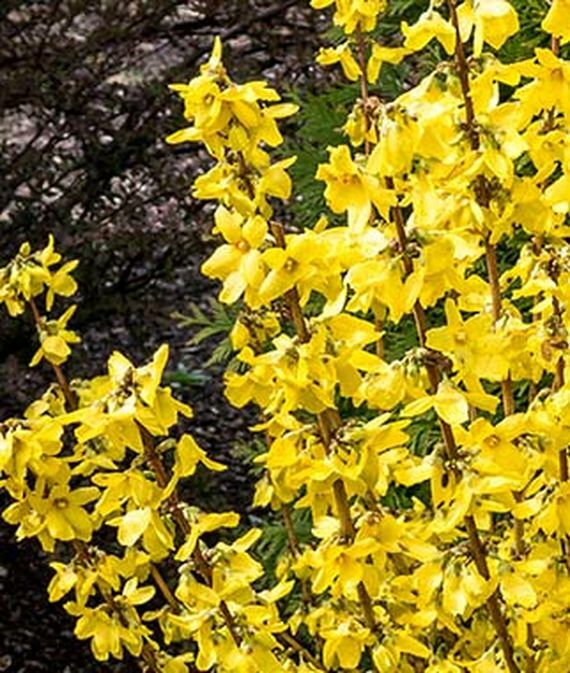 Early Spring blooming Magical Gold Forsythia has long stems covered in gold-yellow blooms. Ideal for forcing spring blooms for bouquets. 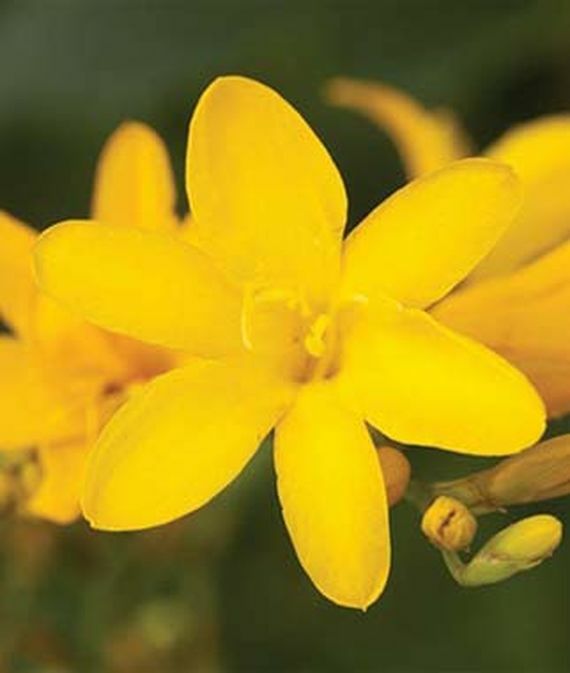 Magical Gold Forsythia grows in zones 5 to 8 in full Sun. Reaching 3 to 4 feet tall. Resistant to disease. 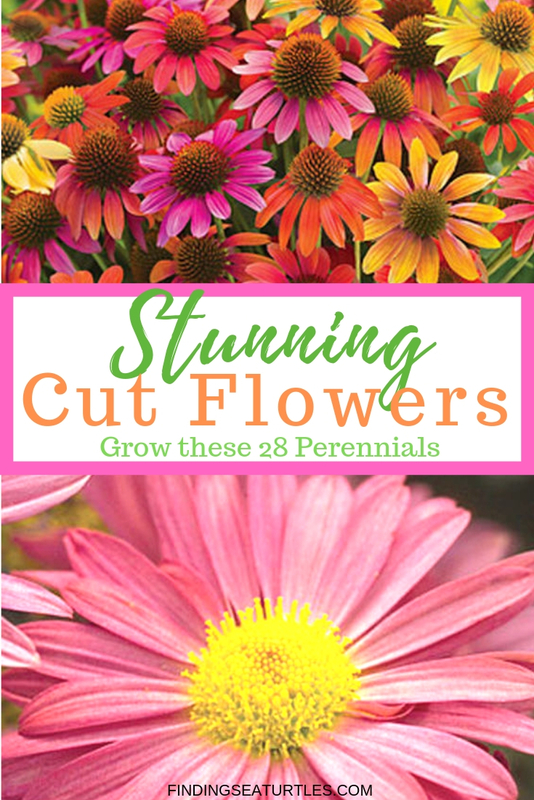 Grow in a cut flower garden or in flower beds. Create beautiful Spring bouquets with Magical Gold. 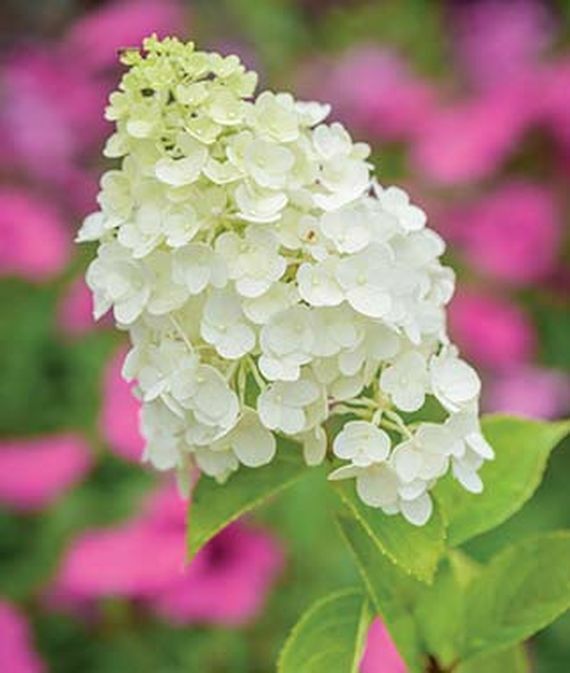 Easy to grow Moonrock Hydrangea has large creamy white flower clusters with lime green centers. As Fall approaches, flowers turn to apple green hues. Moonrock Hydrangea grows in zones 3 to 8 in full Sun to part Sun and part shade. Reaching 4 to 6 feet tall and is a Summer bloomer. Resistant to cold temperatures. A great addition to any cut Flower garden. Plant Moonrock in garden beds or along garden borders. And maybe even a Moonlight Garden! 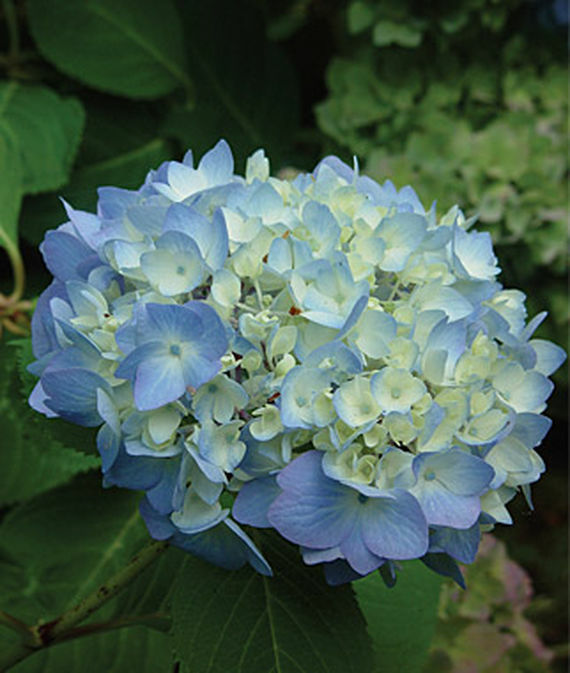 Classic Nikko Blue Hydrangea with 6 inch mop heads blooms appear in July and August. Azure blue color has acidic soil to maintain the blue color. Nikko Blue Hydrangea grows in zones 5 to 9 in full Sun or part Sun and part shade. Grows up to 72 inches tall. Blooms in the Summer and Fall seasons. Resistant to rabbits. Nikko Blue blooms can be used in a cut flower arrangement or as a dried flower arrangement. Use Nikko Blue in a border or hedge for dramatic color. 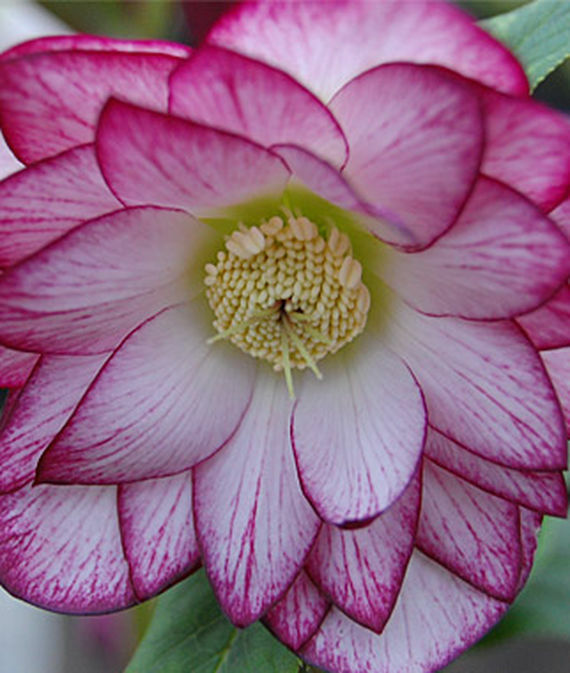 Spring blooming Peppermint Ice Hellebore has gentle pink double flowers with a dark pink picotee edge. Peppermint Ice grows in zones 5 to 8 in part Sun and part shade or full shade. Reaching 12 to 14 inches tall. Resistant to cold temperatures and pests. Deer and rabbit resistant, Peppermint Ice makes a gorgeous cut flower for your home or for giving away. Also can be planted in containers or in garden beds and borders. Summer and Fall blooming David Phlox has white fragrant blooms. David Phlox grows in zones 4 to 8 in full Sun or part Sun and part shade. Tops out at 36 inches tall. Deer resistant David Phlox make great cut floral arrangements. Or plant David Phlox in garden beds and along garden borders. 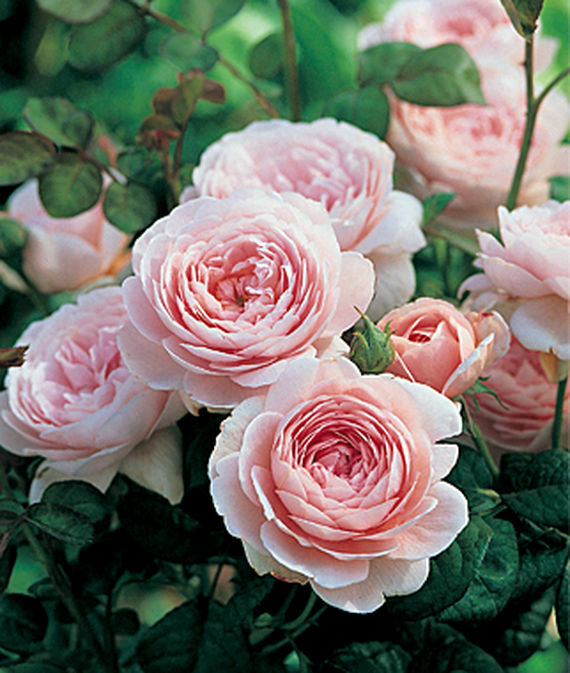 Queen of Sweden English Rose has soft glowing apricot-pink flowers that become pure soft pink. A wonderfully fragrant myrrh scented rose. Lovely Queen of Sweden Rose grows in zones 5 to 9 in full Sun or part Sun and part shade. At 48 inches tall, Queen of Sweden blooms in Spring and Summer. Resistant to drought conditions in the garden. So, the Queen of Sweden rose makes amazing cut flower bouquets. 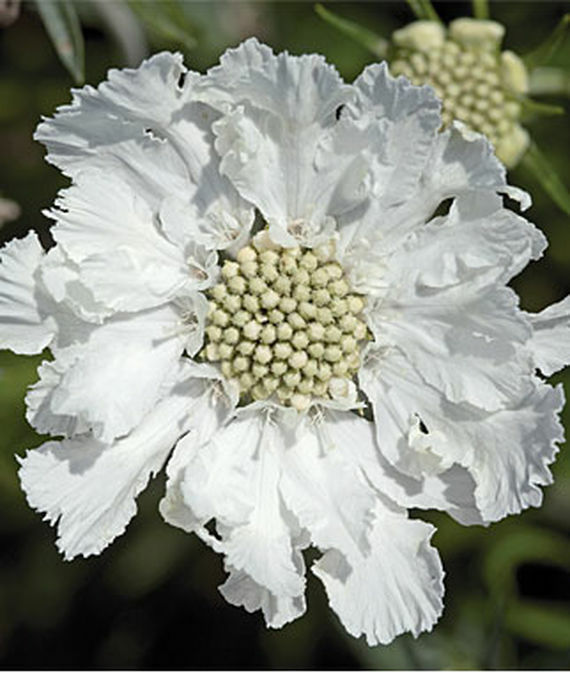 Hardy Fama White Scabiosa has 3 to 4 inch white pincushion flowers. The white blooms look stunning against the silvery-blue foliage. Fama White grows in zones 4 to 10 in full Sun. Topping out between 20 to 24 inches tall. Blooms in Summer. Resistant to heat and drought weather conditions. 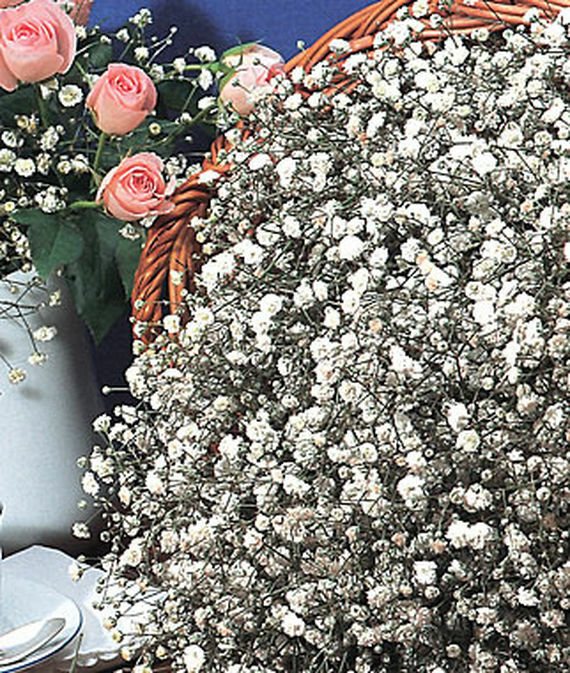 Deer resistant Fama White makes beautiful floral arrangements. Some of our other gardening related posts. These are the 28 Best Perennials for a Cutting Flower Garden. A cutting flower garden with perennials that you select for making bouquets or flower arrangements. There is no lovelier gift than fresh flowers selected from your garden. Fresh cut flowers for Mother’s Day, Birthdays, or for a centerpiece at a dinner party. 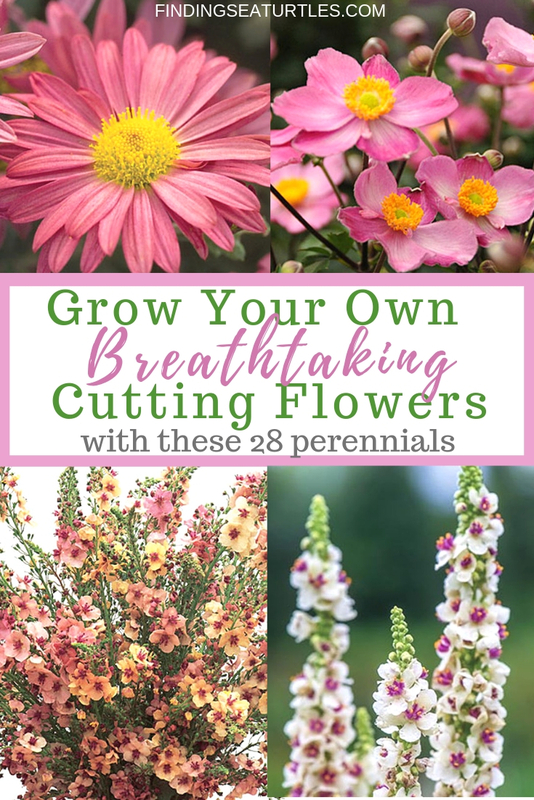 Create your own garden style bouquets with any of these perennials. Try one or maybe a few perennials. 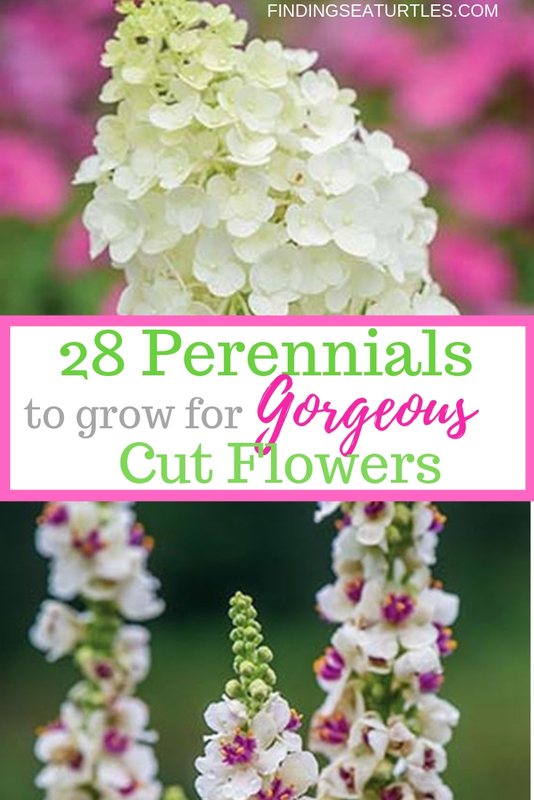 If you try any of these 28 Best Perennials for a Cutting Flower Garden let us know how you make out. If you have any questions, feel free to reach out to us in the comments below. We always are ready to help you out. Can you please tell me if the sweden english rose is a bush or bulp? ps I loved this article, such a big help!